Home Tech News Fabulous: By changing your habits to changing your life! 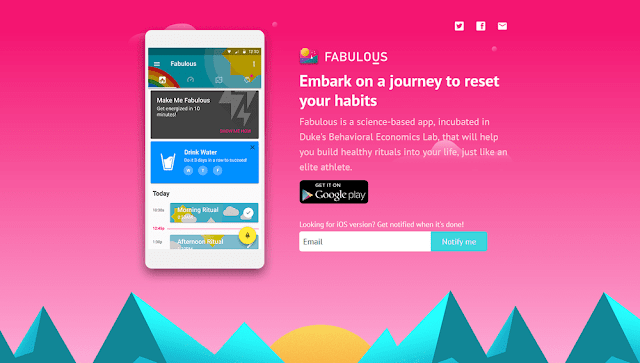 Fabulous: By changing your habits to changing your life! Hello everyone! Today we are going to discuss life and habits. Habits play important role in everyone’s life either they make your life best or worst. So as we all know that we are living in an era of technology. Now there are so many apps which help peoples to perform better and make their life better. So today we are going to tell you about one of the apps which help to make your life better just by changing your daily habits. Yes, there is an app Fabulous this app help peoples to make their life better by changing their habits. Fabulous- Motive Me! Is an app fitness app available on iOS and Android on their play stores? The app is available free of cost on play store. It has the capability to make us become that person that we all have dreamt of and it does it perfectly. So now let’s take a look about this app. Here you get science-based coaching which helps you to increase your energy, Lose the weight, feel light and vibrant, better sleep by promoting healthy habits and daily routine of your life. You can easily reach any of your health and productivity goal with the help of this app by performing step- to-step program every day. Coach yourself with fabulous to reach your goal, lose weight, sleep better, eat better just by installing some healthy living habits which make you forget about low energy and fatigue. How to set up the app ? Now we are going to tell how to set up the app? First, download the app from play store and install it on your phone. After downloading the app opens it and set up as mentioned in screenshots. Here are some options you can choose from them according to you. There are so ways that make your life fabulous. Here you got letters, for example, you got letter one after completing your first task. Well, whenever you complete a task you got one letter from them and another task will be unblocked for you. Reading these letters will be interesting.